Fiddle veneer gets this name from its customary usage as a fiddle surface finish material. Fiddles are classical stringed instruments, such as violins, cellos, upright basses, etc. A fiddle veneer can be identified by the regular streaks running across the grain, and its value is directly proportional to the regularity of these streaks. 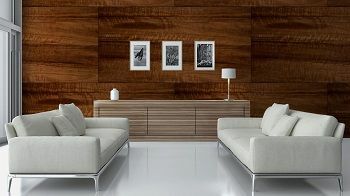 Perpendicular patterns running from edge to edge are produced, by slicing veneer sheets, from quarter sawn logs of European Maple, Oak, Angire, Makore and other such varieties of wood, having an even luster and a natural texture.